Time is ticking on our #TDBringItBack vote! We’re bringing back fifteen classic designs from Tatty Devine history as a limited edition collection and we need your help to decide the all important 15th piece. We’ve narrowed it down to five of Rosie, Harriet and Team Tatty’s favourite pieces, but it’s up to you to choose which one you think should come back over on Facebook. Can't make up your mind? Join Team Tatty as we delve in the back stories, discover the design inspirations and state the case for each piece up for the vote. 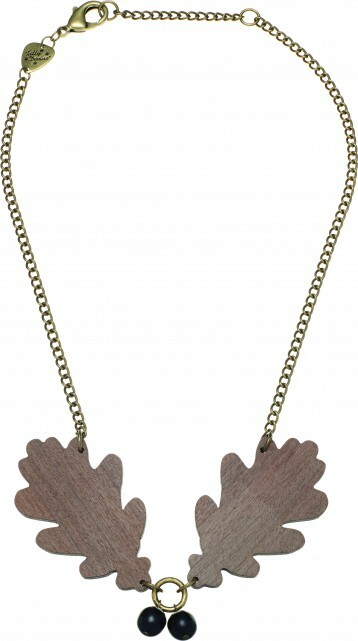 Enter a crisp, autumnal woodland with today's pick: the Wooden Oak Leaves Necklace! Our Autumn Winter 2010 collection, The Age of the Blazing Trails, took inspiration from pioneering women and celebrated Tatty Devine's British roots. Rosie explains, "Being a UK company is important to us and to our identity. There’s a Britishness to Tatty Devine that appeals to our customers. Harriet and I both grew up with a fondness for craft making and a love for handmade items; that element of Britishness and our quirkiness has helped us find a niche, and find customers abroad." Harriet says, "The Wooden Oak Leaves Necklace came from a real autumnal theme. We were thinking of walks in the woods and leaves crunching under foot. It's just so English. When we were designing the necklace, I actually made some mini acorns but the pressed glass beads just work so well with it." Rosie agrees, "Nature has always been a really big influence on both of us. There's something really lovely about using beads in a context where they're like a real object. They're like the nut inside the acorn." Here's a sneaky peek at the original model shot for the Wooden Oak Leaves Necklace. 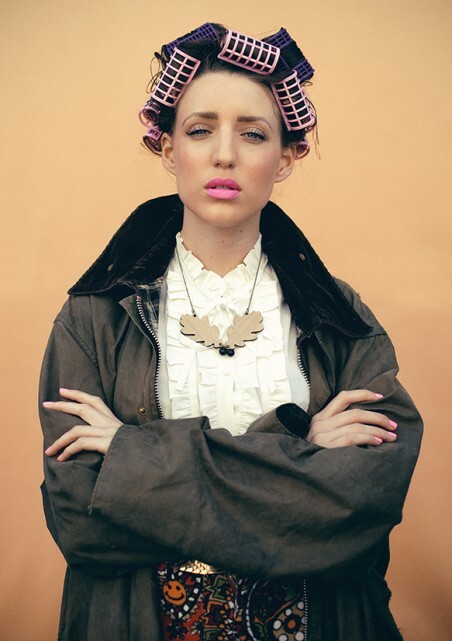 Retro rollers, a colour pop pink pout and classic waxed jacket were the order of the day: Team Tatty says: Studio star Lucy: "I like wearing it with my Barbour when I'm out and about in the countryside. The silhouette is really beautiful and classic. Vote for the Wooden Oak Leaves Necklace, please!" Wish the Wooden Oak Leaves Necklace would return? Simply head over to our Facebook album and cast your vote by liking its photo. Hurry, you only have until midnight on Sunday 13th July to have your say. Don't forget, one lucky fan who votes for their favourite #TDBringItBack piece will win the chosen piece for their collection! The most popular piece will launch in store and online as part of our 15th birthday collection later this year. Get involved and champion the Wooden Oak Leaves Necklace on Twitter and Instagram with the hashtag #TDBringItBack now!